Is it all about the dancing? 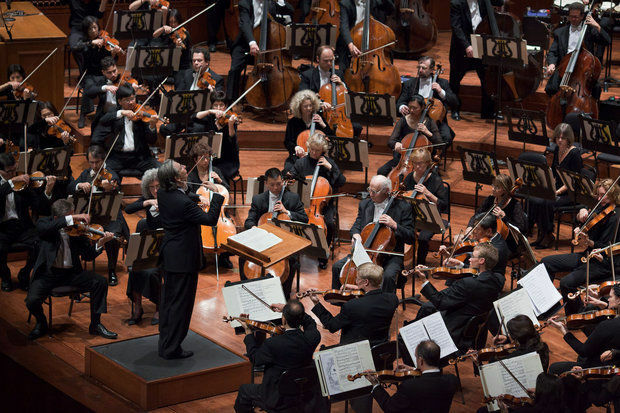 In a way, it was, for better and worse, at the San Francisco Symphony’s second concert of two at Hill Auditorium this week, under University Musical Society auspices. First, you had the devil himself as the fiddler for the country fete in Liszt’s “Mephisto Waltz No. 1.” Then you had violinist Gil Shaham as a perennially perambulating soloist in the second Prokofiev Violin Concerto – scooting left and right across the ample space the orchestra left him as if knowing his desire to dart this way and that to commune with conductor or concertmaster or this or that player. And after intermission, you had Ravel’s “Daphnis et Chloe” – complete, not one of the suites — with a huge contingent from UMS Choral Union (they might have outnumbered the huge Ravel orchestra) singing the wordless vocals. The first half of this Friday evening concert was transfixing. In a lithe and rhythmically vibrant performance, SFS Music Director and Conductor Michael Tilson Thomas and the orchestra brought out all the charm and color of Liszt’s “Mephisto Waltz.” The band tuned up, the devil grabbed his fiddle (or maybe that was Alexander Barantschik, as wizardly concertmaster), and soon enough, sprites and spirits danced with flickering Mendelssohnian lightness before the scene evaporated. The Prokofiev concerto, in Shaham’s hands, was no less magical. He seemed to be taking a sort of elfin glee and pleasure in playing, smiling to the audience and the players in anticipation of the sounds that he’d produce. And what sounds they were. Each lyrical phase in the concerto’s first movement was shaped with arresting dynamic nuance and modulation. His quiet playing drew your ear. And his fast fiddling was a scribble so precise you could have graphed it. If the third movement Allegro was delightful with its Spanish accents (a tributesome to a Madrid premiere, some think), it was the second movement, a serenade in which the violin plays glowingly against mechanical clock triads in the orchestra – the roles are then charmingly reversed later – that was the utter charmer. It will stay in memory a long time. I think my memories of the second half, the complete “Daphnis et Chloe,” will be less strong. I found the work – at about an hour in length – completely trance-inducing, numbingly so, I have to say. I could hardly focus my eyes, let alone my ears, by the end, and I wasn’t surprised, on the way out, to hear one musically tuned-in audience member imitating the endless windlike, moaning sighs of the choral part. When we do hear “Daphnis et Chloe” in the concert hall, it is usually one of the suites (more commonly the second) drawn from the ballet. The full piece, like the suites, is magnificent, shimmering and luminous in its undulant evocation of antiquity and pastoral nature. And both the orchestra and chorus were superb as painters of Ravel’s Impressionist colors and as masters of the dance. But given that the score was actually conceived as ballet music, and that the plot, as expressed in the music, at least, is not much of an anchor most of the time, I had the feeling that the visuals of dance might have focused my ears as well as my eyes. As it was, it was all too easy to feel unmoored. This entry was posted in music and tagged Ann Arbor, Music, San Francisco Symphony. Bookmark the permalink.